The history of Split in its early days revolves around a Greek settlement founded in the area between the 3rd and 4th centuries. Its most famous historical development, however, came in 295 AD when Roman emperor Diocletian ordered a residence to be built there for his retirement, as it was close to the nearby large Roman settlement of Salona (present-day Solin, about 5km from Split). 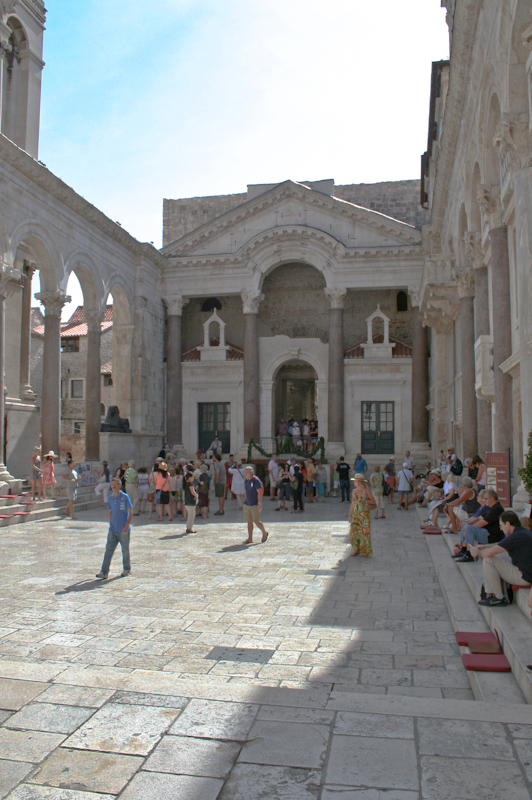 It took ten years to build this magnificent palace and Diocletian lived there until he died in 313 AD. After his death, many Roman rulers continued to use it as a retreat although by the later part of the 6th century it had fallen into disrepair. In the 7th century, when the Roman colony of Salona (Solin) was abandoned, many of its inhabitants sought sanctuary behind the palace’s high walls and their descendants continued to live there over the centuries. During the 11th century and after, the city of Split grew considerably in the areas around the palace. The city enjoyed a good degree of autonomy between the 12th and 14th centuries before it was conquered by the Venetians in 1420. After the fall of Venetian rule in 1797, Split was ruled by the Austrians, and briefly by the French. In the 20th Century, after the break up of the Austro-Hungarian Empire, Split became a part of the Kingdom of Serbs, Croats and Slovenes that was formed in 1918. Much of its development occurred after 1920 when Zadar, Dalmatia’s official capital, became an Italian enclave, and Split took its place as the main city in the region. In 1941, the city was occupied by the Italians and a very strong resistance movement soon evolved with the city first being liberated in 1943, after the capitulation of Italy. Although then becoming occupied by Germany, it was finally in the October of 1944 that Split was liberated again when the first people’s government of Croatia was formed. As part of Yugoslavia after World War II, Split experienced substantial growth as government investment in the city saw factories built for a number of different industries. Split had a large ship-building industry that saw Yugoslavia become one of the top countries in the world in that field; the city also became an important port. Split did not suffer much damage during the war that broke out in 1991, despite the Yugoslav Navy and and the Yugoslav Army’s coastal district being based there. Since Croatia’s independence, Split suffered as its once strong industry entered into decline. However, it has recovered somewhat in recent years.